If you think roast dinners are for special occasions with lots of prep, long roasting times, and a big cleanup, try this Weeknight Roast Dinner formula. You can have a small roast seasoned and the vegetables prepped by the time the oven preheats. After that, it’s just 25 minutes of roasting. Nothing more for you to do, so relax. Simply coat thick-cut fish, chicken thighs, sausage, or a small pork, beef, or lamb roast with a spice rub that flavors it completely and browns it quickly, pair it with a pan full of seasonal vegetables, and pop it in a hot oven. In 25 to 30 minutes, you can be serving what might be confused with a holiday dinner—all on a Tuesday night. Bell peppers, all colors: Quarter if small; cut into sixths if large. Seed and stem. Broccoli crowns: Halve or quarter, depending on size. Cabbage, small: Halve, don’t core, and cut into small wedges. Cauliflower: Trim and cut into large florets. Fennel: Trim, halve, core, and cut into quarters or sixths, depending on size. Leeks: Clip dark green leaves. Leaving root end intact, quarter lengthwise, wash thoroughly, and then cut crosswise into 3- to 4-inch lengths. Mushrooms, domestic white or cremini: Leave whole. Onions, red, white, or yellow: Leaving root end intact, peel and halve pole to pole. If small, leave as is; if medium to large, cut into thick wedges. 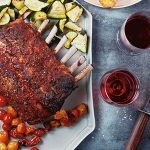 The mustard in each ingredient in the spice rub are key to the roast’s color and flavor. Ordinary salt and pepper, which enlivens any cut of meat, headline the spice rub’s ingredient list. Garlic powder, as well as mustard, reinforce the roast’s savoriness—plus, the mustard helps the spice rub adhere. Since these cuts roast only for 20 to 30 minutes, the brown sugar and paprika helps develop rich color. Measuring the spice rub ingredients takes only a couple of minutes. Once you measure out 2 tablespoons for today’s roast dinner, there’s enough for 8 more dinners to come. 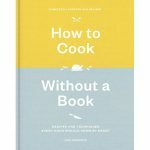 Reprinted from How to Cook Without a Book. Copyright © 2018 by Pam Anderson. Photographs copyright © 2018 by Lauren Volo. Published by Clarkson Potter, an imprint of Penguin Random House, LLC. Adjust the oven racks to lowest and high positions and heat the oven to 450°F. Coat one small (13 × 9-inch) and one large (18 × 12-inch) rimmed baking sheet with vegetable cooking spray. Mix the all-purpose spice rub with the Rub Add-ins (if using). Lightly sprinkle the Protein with salt, brush all over with the mustard, coat with the spice rub, and place on the small baking sheet. Working with one kind at a time, place the Vegetables in a medium bowl, drizzle with a tablespoon or so of oil, and sprinkle generously with salt and pepper; toss to coat. Turn them onto the large baking sheet, keeping each of the Vegetables separate and making sure they fit loosely in a single layer. 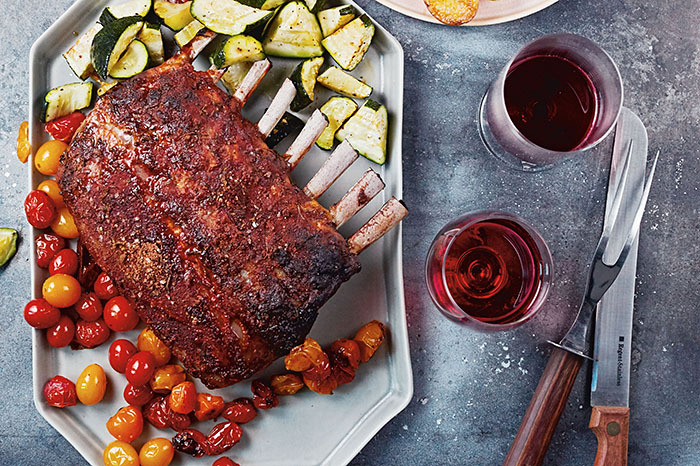 Place the vegetables on the lowest oven rack and the protein on the highest oven rack. Roast until the vegetables have cooked through and the protein is cooked to the desired doneness, 20 to 25 minutes. Remove from the oven and let stand for a couple of minutes. Slice or divide the cuts, if necessary, and serve. NOTE: Asparagus is the only vegetable that shouldn't roast the full time. Just toss with oil, salt, and pepper and add the roasting vegetables at the end of cooking (adding thick asparagus the last 10 to 12 minutes, medium asparagus the last 6 to 8 minutes, and thin asparagus the last 4 to 5 minutes).